Maitake, Grifola frondosa (hen-of-the-woods, ram's head, sheep's head), is a polypore mushroom that grows in clusters at the base of trees; particularly oaks. It is typically found in late summer to early autumn. The fungus is native to the northeastern part of Japan and North America, and is prized in traditional Chinese and Japanese herbology as a mushroom, an aid to balance out altered body systems to a normal level. Grifola frondosa grows from an underground tuber-like structure known as a sclerotium, about the size of a potato. The fruiting body, occurring as large as 100 cm, is a cluster consisting of multiple grayish-brown caps which are often curled or spoon-shaped, with wavy margins and 2–7 cm broad. The undersurface of each cap bears approximately one to three pores per millimeter, with the tubes rarely deeper than 3 mm. The milky-white stipe (stalk) has a branchy structure and becomes tough as the mushroom matures. Maitake is rich in minerals (such as potassium, calcium, and magnesium), various vitamins (B2, D2 and niacin), fibers and amino acids. In vitro research has shown the Maitake mushroom may support healthy cellular function. Research has shown Maitake may also support a healthy metabolic rate. 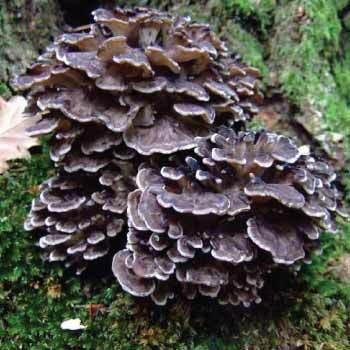 As a dietary supplement, take 1000mg of Maitake Mushroom Extract once daily. Where to Buy Maitake Mushroom Extract? Nootropics Depot offers 30g or 60g jars of certified organic Maitake Whole Fruiting Body Mushroom Extract. Nootropics Depot's Maitake mushroom extract powder has been lab-tested and verified for both product purity and identity. To learn more, read the Maitake mushroom reviews and experiences below. The title says it all. Also, confers similar mood and immune benefits of most, if not all the other mushrooms. But, Maitake is great. I take this along with ND's chaga extract. I've also read a lot about maitake.